It seems we won’t see the launch of a Surface Pro 5 any time in the near future, sadly, although Microsoft may well give the current Surface Pro 4 a spec bump at an event later this month. There are several sources chattering about Microsoft’s hybrid range, the main one being CNET who interviewed Panos Panay, chief Surface dude at Microsoft (corporate vice president for Surface Computing, to be precise). At the close of the interview, CNET pressed Panay on what we’ve all been wondering: that given the Surface Pro 4 is getting pretty long in the tooth, where is its successor which has previously been rumored to be incoming for a while now? 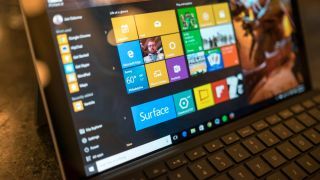 Panay essentially replied that the Surface Pro 4 would remain a competitive product for five more years, and that he was “super, super sure” of that – in other words, buy the SP4, there’s no need to hold out for a Surface Pro 5. Mainly because the SP5 is not coming until the company develops some “meaningful changes” for the hardware. In other words, not just a processor upgrade, but a big boost on vital aspects such as battery life and/or making the device thinner and lighter (generally more portable). He clarified: “You'll see that same meaningful impact when Pro 5, or Pro Next hits the market," swiftly adding that, "there's no such thing as a Pro 5." In other words, there’s no such thing as a finished Surface Pro 5 design right now, meaning that it’s still a long way down the line. At the same time, Microsoft has an event in Shanghai, China on May 23 which is Surface-related, where it will ‘show the world what’s next’. Panay will be there, and tweeted about the event with the hashtag #surface. Clearly, though, this isn’t going to be the Surface Pro 5 – Panay was clear about that in the CNET interview – but Microsoft may reveal a new juiced-up Surface Pro 4 model, which matches up with what we heard from the hybrid grapevine last month, namely that a ‘Surface Pro 4.5’ was in the works. In other words, a light refresh introducing Kaby Lake CPUs to the current range, and possibly some other minor hardware boosts. Similar to what happened with the Surface Book when Microsoft introduced the Performance Base variant (there’s still no news on the Surface Book 2, either). As ever, this is all speculation, but at least we won’t have to wait long to see what Microsoft has planned, because this Chinese press shindig is only a couple of weeks away.